Joking about one of the common threads among almost all advertising conferences, it was suggested to start a drinking game for each time the term 'SEO' was mentioned. The second in the lineup for Thursday was a presentation about The Future of Search Marketing made by Ron Belanger of Yahoo!. Belanger's talk quickly thwarted the expected SEO lecture, and discussed more about the power of search and the audience that resonates with it. Belanger explained that it is not only about 'Web 2.0', but also about Consumer 2.0. The new consumer is overworked and overwhelmed, yet is consistently addicted to leisure and information. As the consumer becomes more tech-savvy, search sees an increase in usage. 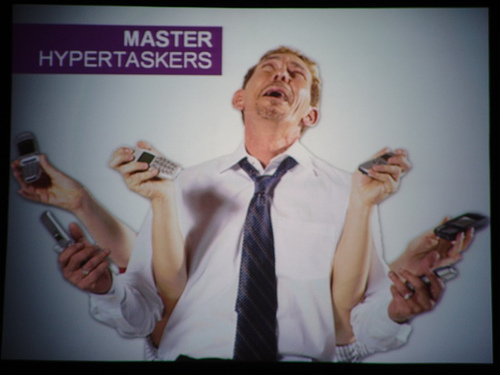 Calling them "master hypertaskers", Belanger pointed out that the common information junkie goes far beyond the traditional idea of a multitasker. Handing out a few stats, surveys show that 50 percent of internet surfers do it while they watch TV, while 36% of TV watchers are actually asleep while their tube remains on. With a search-savvy audience, the openness to new brands increases dramatically. Of a surveyed search-savvy audience, 79 percent had been introduced to new brands through search. Unlike banner ads, searchers tend to be more engaged than a advertising click-through. Brand such as Special K have tapped into this insight, by asking users to search for their brand on Yahoo! as opposed to trying to remember a web address. Asking to "flip the funnel" by being involved in "participation marketing", the four qualities of identifying, listening, collaborating, and providing tools to share were all pre-requisites. It is clear that the days of search optimization will continue to transition into a more enriching search augmentation experience. Photos from FOOA and the trip to New York can be viewed here.